German Catholic Painting Movement in Rome. Part of the broad Romanticism movement in German 19th-Century art, the Nazarenes were a group of young idealistic German Romantic artists born around the 1780s, who were pupils together at the Fine Arts Academy in Vienna. Believing real life too banal to portray, they shunned it in favour of matters of the spirit, and focused on Christian art, in the tradition of Medieval painting, notably German medieval art and Italian early Renaissance painting. Led by Friedrich Overbeck (1789-1869), other members included Franz Pforr (1788-1812), Wilhelm von Schadow (1788-1862), Julius Schnorr von Carolsfeld (1794-1872), Ludwig Vogel, and Johann Konrad Hottinger. They were later joined by others in Rome, such as Peter von Cornelius (1783-1867), Johann Anton Ramboux (1790-1866) and Phillip Veit. The name "Nazarenes", first coined in 1817 by the Austrian painter Joseph Anton Koch (1768-1839), a follower of Nicolas Poussin, was given to them on account of their devout way of life, biblical dress and long hair. The group formed in Vienna in 1809, with the clear intention of repudiating what was being done at the time in the German school - in particular the official, academic painting style established by the neoclassicist Johann Joachim Winckelmann (1717-68). In 1810, Overbeck, Pforr and a couple of others moved to Rome where they occupied the disused convent of Sant Isidoro. Here, between 1810 and 1815 they worked together and led an almost monastic life, founding the Brotherhood of Saint Luke (Lukasbruder) after the patron saint of fine art painting. In 1811 they were joined by Peter Cornelius and others. Their painting was based on early German Romanticism, medievally inspired and patriotic, but steeped in Christian mysticism and religion. Inspired by their Catholic faith, they believed that art should serve a religious or moral purpose and sought to return to the style of the German Renaissance under Albrecht Durer (1471-1528), Stefan Lochner (c.1400-51), Michael Pacher (1435-98), and Matthias Grunewald (1470-1528). Nazarene painters also sought to revive the ingenuous idealism of the painting of the Italian Trecento (1300-1400) and Quattrocento (1400-1500) by emulating Italian artists like Perugino (1450-1523) and Fra Angelico (1395-1445) who had worked before Raphael (1483-1520), and the dominance of the classical aesthetics of the High Renaissance. The influence of Baroque painting can also be seen in Nazarene works, making the resulting style quite eclectic. Furthermore, they believed stronly in the primacy of drawing (what Italians called disegno) rather than colour (what Italians called colorito). Their patriotic spirit led them to concentrate on history painting (representing scenes from German history, both real and fictional), but they were also very fond of religious art (biblical scenes from the Old and New Testaments) as well as allegorical themes, and (like the Pre-Raphaelites) the illustration of literary subjects. One of the group's main aims involved the revival of monumental fresco painting, and they gained two major commissions - Casa Bartholdy (1816-17) and Massimi Palace (1817-1827) - that made their work internationally known. The former was executed for Jacob Salomon Bartholdy, the Prussian Consul-General in Rome (frescoes now in the Alte Nationalgalerie, Berlin); the latter for the Marchese Massimi (frescoes in situ). Subjects which appear in these examples of Nazarene mural painting include themes from Dante's Divine Comedy, Aristo's Orlando Furioso and Tasso's Jerusalem Delivered. Nazarene work is typically clear and attractively coloured but too often rather insipid. Generally speaking, modern taste has been more sympathetic towards the Nazarenes' sensitive landscape painting and portrait art, rather than their didactic figure painting. They disbanded as a formal group during the 1820s but their views on fine art continued to be influential and the name "Nazarene" was used to describe works by younger followers until about 1850. In 1819, Peter Cornelius was called to Munich by Crown Prince Ludwig of Bavaria, where he worked on a series of fresco paintings in the Ludwigskirche (1836-9) including a version of the Last Judgment that is even bigger than Michelangelo's in the Sistine Chapel. Later he became director of the Fine Art Academy at Dusseldorf (1821-25) and Munich (1825-41), becoming an influential figure in German 19th century painting, especially in the area of fresco murals. Friedrich Overbeck, meantime, remained in Rome for the remainder of his life, although he paid several visits to Germany. If Cornelius was a particular enthusiast of historical art, Overbeck - high-minded and didactive - painted almost exclusively religious works. 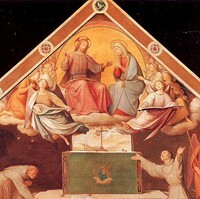 His most famous painting is the Rose Miracle of St Francis (1829, Porziuncola Chapel, S. Maria degli Angeli, Assisi). His workshop duly became a rendezvous in Rome for artists from around Europe, including the Austrian Biedermeier painter Ferdinand Georg Waldmuller (1793-1865), the English artist Ford Madox Brown (1821-93) and the Scottish painter William Dyce (1806-64). The group closest to the Nazarenes is probably the Pre-Raphaelite Brotherhood that appeared in England around 1848 as a reaction against academicism in Victorian painting. Another movement influenced by the Nazarenes - and 15th century Umbrian painting - was Purismo (early/mid-19th century), led by the Italian artist Tommaso Minardi (1787-1871). See also the Romantic-Realist Biedermeier Style (c.1810-60), popular in Austria, Germany and Denmark. Joseph Interprets Pharaoh's Dream (1816-18) Casa Bartholdy fresco, Berlin. Jerusalem Delivered (1817-27) Casino Massimo fresco, Rome. Italia and Germania (1828) State Art Collection, Dresden. Rose Miracle of St Francis (1829) Porziuncola Chapel, Assisi. The Count of Habsburg & the Priest (1810) State Culture Institute, Frankfurt. Clara Bianca von Quandt (1820) Alte Nationalgalerie, Berlin.  For more about German Romantic painting, see: Homepage.